Here are some snazzy birthday facts about 15th of October 1981 that no one tells you about. Don’t wait a minute longer and jump in using the content links below. Average read time of 10 minutes. Enjoy! What day was my birthday Oct 15, 1981? October 15, 1981 was a Thursday and it was the 288th day of the year 1981. It was the 42nd Thursday of that year. The next time you can reuse your old 1981 calendar will be in 2026. Both calendars will be exactly the same! This is assuming you are not interested in the dates for Easter and other irregular holidays that are based on a lunisolar calendar. What day is October 15 this year? There are 179 days left before your next birthday. You will be 38 years old when that day comes. There have been 13,700 days from the day you were born up to today. If you’ve been sleeping 8 hours daily since birth, then you have slept a total of 4,567 days or 12.50 years. You spent 33% of your life sleeping. Since night and day always follow each other, there were precisely 463 full moons after you were born up to this day. How many of them did you see? The next full moon that you can see will be on April 19 at 11:14:00 GMT – Friday. Fun stat: Your first one billion seconds (1,000,000,000) happened sometime on June 23, 2013. If a dog named Flopper - a Barbet breed, was born on the same date as you then it will be 186 dog years old today. A dog’s first human year is equal to 15 dog years. Dogs age differently depending on breed and size. When you reach the age of 6 Flopper will be 42 dog years old. From that point forward a medium-sized dog like Flopper will age 4.5 dog years for every human year. View the complete list of October 15 celebrity birthdays. Who are the famous October 15 birthdays? Here’s a short list of famous people in history who were born on Oct 15. View the complete list of October 15 famous birthdays. What happened on my birthday – Oct 15th? The Siege of Vienna ends as the Austrians rout the invading Turks, turning the tide against almost a century of unchecked conquest throughout eastern and central Europe by the Ottoman Empire. American Civil War: The H. L. Hunley, the first submarine to sink a ship, sinks during a test, killing its inventor, Horace L. Hunley. The Dreyfus affair: Alfred Dreyfus is arrested for spying. The Soviet Republic of China collapses when Chiang Kai-shek’s National Revolutionary Army successfully encircles Ruijin, forcing the fleeing Communists to begin the Long March. The President of Catalonia, Lluís Companys, is executed by the Spanish dictatorship of Francisco Franco, making him the only European president to have been executed. The Arrow Cross Party (very similar to Hitler’s NSDAP (Nazi party)) takes power in Hungary. World War II: The former premier of Vichy France Pierre Laval is shot by a firing squad for treason. The Black Panther Party is created by Huey P. Newton and Bobby Seale. NASA’s Galileo spacecraft passes within 112 miles of Jupiter’s moon Io. A 7.2-magnitude earthquake strikes the Philippines, resulting in more than 215 deaths. View the complete list of October 15 historical events. What does my birthday October 15, 1981 mean? Your birthday numbers 10, 15, and 1981 reveal that your Life Path number is 8. It represents experience, authority and endeavour. You are gifted with natural leadership and the capacity to accumulate great wealth. The following celebrities also have the same life path number: Newton Faulkner, Laurence Olivier, Jim Hutton, Gino Quilico, Kim Ji-soo, Rakhee Thakrar, Tamara Taylor, Steve Holy, Ernie Reyes, Jr., Shawn Bradley. 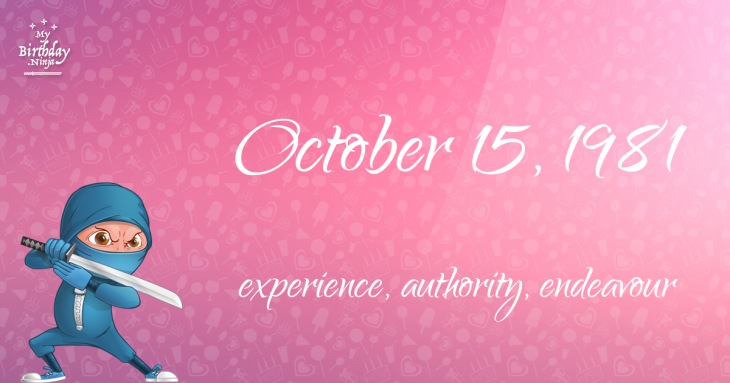 What is the birthday horoscope for Oct 15, 1981? The Western zodiac or sun sign of a person born on October 15 is Libra ♎ (The Scales) – a cardinal sign with Air as Western element. The ruling planet is Venus – the planet of love and beauty. According to the ancient art of Chinese astrology (or Eastern zodiac), Rooster is the mythical animal and Metal is the Eastern element of a person born on October 15, 1981. What is the birthstone for October 15? Fun fact: The birth flower for 15th October 1981 is Cosmos for constancy. What is the Love Match for Oct 15, 1981? When it comes to love and relationship, you are most compatible with a person born on February 7, 1986. You have a Love Match compatibility score of +155. Imagine being in love with your soul mate. On the negative side, you are most incompatible with a person born on July 3, 1990. Your incompatibility score is -169. You’ll be like a cat and a dog on a love-hate relationship. Arf-arf, I want to bite you. Meow-meow, stay away from me! What is a good birthday trivia for October 15? The number-one hit song in the U.S. at the day of your birth was Arthur’s Theme (Best That You Can Do) by Christopher Cross as compiled by Billboard Hot 100 (October 17, 1981). Ask your parents if they know this popular song. I do not know how you feel about this, but you were a female ♀ in your last earthly incarnation. You were born somewhere around the territory of USA North-East approximately on 1025. Your profession was handicraftsman, mechanic. How many babies were born on October 15, 1981? Base on the data published by the United Nations Population Division, an estimated 127,030,934 babies were born throughout the world in the year 1981. The estimated number of babies born on 15th October 1981 is 348,030. That’s equivalent to 242 babies every minute. Try to imagine if all of them are crying at the same time. What is the popular baby name on 15 Oct 1981? What’s your bizarre Florida Man story? The #FloridaManChallenge is breaking the Internet and social media. Some crazy men, women, or creatures from the Sunshine State are making headlines every day of the year including your birthday. Try this fun exercise. Pick your search engine of choice and type in “florida man October 15” and see what kind of wild news headline you will get. This viral craze started in 2013 and gets resurrected now and then. The latest was from Tumblr and found its way to Twitter. As they say, the rest is history. Here’s a quick list of all the fun birthday facts about October 15, 1981. Celebrities, famous birthdays, historical events, and past life were excluded. 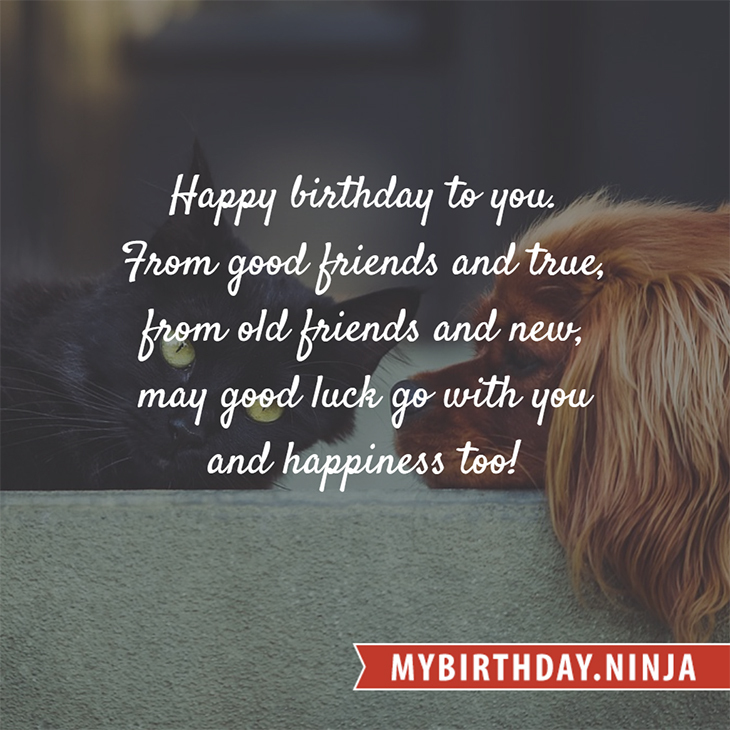 Try another birth date of someone you know or try the birthday of these celebrities: April 12, 1986 – Athena Lundberg, American model; December 5, 1903 – Johannes Heesters, Dutch-German actor and singer (d. 2011); June 2, 1987 – Darin Zanyar, Swedish singer-songwriter.